This was an awesome jacket. I saw a kid in my regular coffee house wearing this jacket the other day. 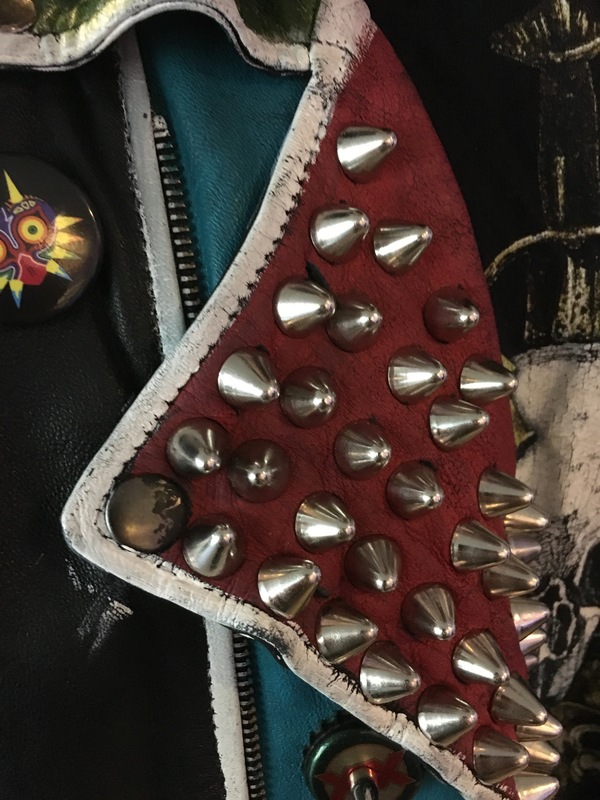 He was wearing this customized leather biker jacket, tricked out like the biker jackets of the punk scene in the late 1970s and 1980s. It had been painted in turquoise, white and maroon paint and adorned with layered rows of metal studs. All the work had been done by hand. 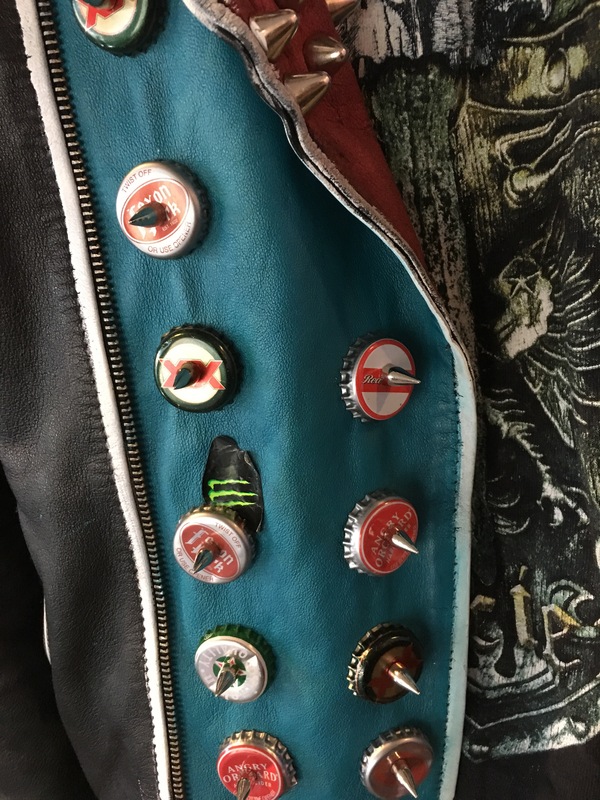 I call him a kid, but let’s face it, some of those bottle caps are beer caps. He’s probably in his early 20s. I hope. I asked him if I could photograph some of the detail work. I think he thought I was going to take a picture of him in his jacket, so he put it on. In retrospect I wish I had — but I feel uncomfortable about photographing strangers. Even strangers wearing clothes they made. Or at least customized. Still, I was impressed. it was a lot of work, 10 or 20 hours of labor customizing this jacket. We might disapprove of the message this kid is sending to the world, wearing a studded leather jacket. Or maybe we approve: I certainly do. But rather than purchasing such a jacket pre-made for some fashion line, this kid correctly recognized that there was a DIY ethic at work. He did the work himself. He customized an off the rack leather jacket to express his self-identity to the world. And maybe we should encourage that in our students more — not because we want everyone walking around in studded leather jackets, but because we would like people to be able to express their creativity and their hope for a more individualized world, even in off-the-shelf components.